I've just landed in Madrid, and thankful for that, as some in the UK are on strike today, and I was never quite certain if the journey would be as smooth as it should be. And on the flight, I watched a video replay of our Geo VP hour from yesterday, where our business leaders spelled out their strategy and direction with energizing clarity! It's a great team to work in! And, we launched quite a few new maps bits... including indoor navigation in a few places, notably in the US in a few airports... and in Japan too. I can't wait for it to land here in Europe in more places. But this video had me smiling... an Ikea in Sweden and the UK and the US all look identical inside, don't you think? I've been privileged to walk around with a pre-production Nexus Galaxy in my pocket for a few months now... to the envy of those in the know. I am on the trusted tester program for ICS and I love ice cream sandwich! It's fantastic, and the device is super, super sweet. I was sworn to secrecy, even to the point where I could not show my colleagues, but as I had to use it as my only phone. What a pleasure! Inevitably some who know the look of the Nexus S or Nexus One or follow the industry, would sometimes pause and ask... at which point I just had to put it back in my pocket. But the cat is out of the bag... the Nexus Galaxy is available to buy in shops in the UK... so I am allowed to speak (at least a bit) about it. If an entrepreneur joins a company, it's not because they failed! I suddenly woke up thinking about a discussion I've had with a few friends over lunch at the fantastic new Google canteen in 123... and just realised that my colleagues made a very wrong assumption about an ex-colleague who resigned a year or so ago. She started her own business, and are now apparently considering contracting or joining another company. The wrong assumption they made, was that any entrepreneur who signs up for a "proper job" must have failed as entrepreneur. Not true. I can think of many reasons why an entrepreneur might choose to sign up for a "proper job", temporarily. 1) (Ok - not that interesting... but perhaps useful one day!) The Chromebook SIM card can receive texts, and results in a pop-up message with the SMS text displayed. 2) The earphone plug on the Chromebook actually can and does double as a microphone plug too, so you could plug in iPhone-style headphones with a microphone in the wire, for hangouts and more. Built in micUSB mic (which I've been using mostly thus far, with no problems)mic/headphone combination as described above. And in hind sight - I should have known... See the picture. HTML5 has some fantastic features... I can see many fat client, flash or Silverlight applications that I've built in the past, could now be done with a few simple HTML5 tags! 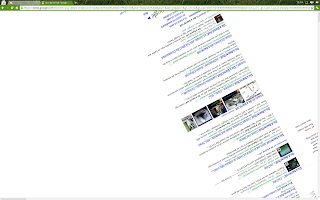 For a bit of fun on your android... try searching on Google for tilt and watch the subtle tilt on your Google search results! Or, on your desktop, search for tilt or do a barrel rolland if your browser is HTML 5 capable (like Chrome), you'll see some of the magic in action.